…and the day isn’t over yet. It was my usual early morning start today with Brendan waking up a bit after 6am. It was the start of what has been a very busy day. 12 hours later and the day isn’t over yet. Once I got Declan off to school, I started getting Brendan ready to head out for the first appointment with our new GP. Getting him ready takes about an hour. Loading him into his wheelchair, then into the van, takes about another 15 minutes. It’s not a quick task, to be sure. In the midst of getting Brendan ready, the post came. A letter changing the appointment time to see his new Paediatrician. (Insert a rise in blood pressure) The appointment with the new dietician was scheduled for immediately after the original appointment with the Paed. Now, they were 3 hours apart. Brendan is on a 2 hours maximum restriction sitting in his wheelchair because of his recently-healed pressure sore looking very red again. Considering the 30 minute drive to the hospital, the 30 minutes back, and the time taken in the appointments, he’d be stuck in his chair – on his pressure sore – for approximately 5 to 6 hours…and that just can’t happen. So, I rang to change the dietician appointment, but had to resort to leaving a voicemail. No surprise there and no reply since. I’ll never stop saying that sending a letter to a patient to notify them of an appointment, or a change to an appointment, is a frustrating and nonsensical way of doing business. Ring the patient, tell them what dates/times are available, and let them choose. Happy days for both parties! Brendan and I got to the new GP clinic no bother, that is until we went down the path to the side of the building to find the door to the lift up to the clinic. The path was barely wider than Brendan’s chair. We get to the door. It opens outward. I couldn’t reach it and with the narrow, walled footpath, I couldn’t turn him around. So, I backed him up down the path, turned him around, and wheeled him backward back down the narrow path to the door. I pulled the door open, held it open with one hand while trying to pull his chair in with the other hand. Yeah, it was pretty much a disaster. Just another example of how wheelchairs are not considered. Accessible? Yes. Barely accessible? Definitely better put. We get to the lift, go in, and the doors won’t shut because Brendan’s chair is fairly big in comparison to a lot of wheelchairs. So, I had to lift him up in his wheelchair and wedge him in at a 45 degree angle, with me stuffed in the far corner of the lift. Finally, the doors closed and up we went. Shall I mention that *barely accessible* issue again? The GP was running late and without me saying too much, the appointment was rushed toward the end. I didn’t get to tell him some of things I was really hoping I could. I left feeling like he was glad to see me go. Now, I’m not saying that’s how he felt. I’m saying that is how I felt in the rush for him to see the next patient. After the appointment, Brendan and I took a quick stroll along the boardwalk. Wouldn’t you know, he ended up with a dirty nappy. It wasn’t pretty. In fact, when we got home, I ended up having to remove the seat and back of his wheelchair to remove the covers so to wash them. Then I had to scrub down his wheelchair on one side. Yeah, you get the idea of what happened. As they say, sh*t happens…and trust me…it did! I also received confirmation today that I will not be able to get a Rebuilding Ireland home loan because I am a full time carer, and being a carer 24/7 is not “employment” in the eyes of the government. The struggles that full time family carers face as they are relegated to social welfare is soul destroying. With only a few months left to get a safe, suitably-modified bungalow for Brendan before his spinal fusion, this is truly a crisis situation. Declan goes off tomorrow evening on his first camping trip with Scouts. That’s me tonight – finishing up the packing of gear and double checking the long list of items he’s to bring. Homework, dinner, and here I am, sitting down for a few minutes before carrying on with the bedtime routine for both boys, washing up, wheelchair re-assembly, laundry and finishing off the camping gear packing. I’ve had people ask me why I don’t give up – Give up advocating for disability and carer rights. Give up pointing out the failings of the government when it comes to those rights. Give up fighting for suitable housing so I can properly care for my son. Give up going public about our struggles on this journey. And, I’ve even had people ask me why I don’t give up Brendan Bjorn. I don’t give up because if I do, who will take my place? I know that some people get tired of my posts about disability on social media. I understand that, although I think they should ask themselves why they get tired of it. Why don’t I give up talking about it? Because the fact is – you or someone you know, maybe even someone you love with all of your heart, is or will become disabled at some point in your life. I think at the core of people’s avoidance of this subject is fear. Fear that *it* could happen to them, to their child, or to a loved one. Trust me, I never could have dreamt I’d be on this path today…but here I am. So to those of you who may have issue supporting the disability rights cause, I ask you to consider what I’ve just said and then do all you can to assure reforms are made sooner rather than later. This isn’t just my future. It’s yours, too. In 2007, I established the CMV Foundation (dissolved as of 2015) because I couldn’t give up my desire to have the world know about CMV and to protect their unborn babies. I was filled with rage at the specialists not warning me about CMV. I was consumed with grief and heartbreak over the news that my perfectly healthy son was, in fact, not. Honestly, if I didn’t start the charity and become such a passionate advocate, I think I would have imploded with all of the rage, grief and heartbreak. And as I sit here today, not much has changed in that regard. I can’t give up my fight for housing, because this is the last dream I can make come true for my precious son: To provide him with a safe, warm, dry, suitable home in which he will spend his remaining years with me and his little brother, creating memories that will last us through our lifetimes. So, I can’t give up. I won’t give up, because he deserves this, at the very least. It was this week 5 years ago that I took Brendan and Declan on a trip to Universal Studios in Florida. I looked at the photos on Facebook this morning as they popped up to remind me of the trip, and I cried. Oh, how I cried bittersweet tears as I realise Brendan will never travel outside of Ireland again, his body having grown far too fragile for such adventures. But, it does my heart good to know I took him on as many adventures as I could! Disney World and Universal Studios. Up into the mountains and to oceans and lakes. He’s seen Old Faithful blow, fireworks light up the sky and felt snow fall on his face. He’s been fishing and has flown a kite. He’s travelled in airplanes across America and Ireland and the UK. He has met a President and celebrities and has been on TV across America – and his share of media here in Ireland, too! I am truly happy he got to experience those things while he could. I just hope I’ve given him enough adventures to fill his lifetime. So, I can’t give up. The fight continues, not just for our own personal journey and for what Brendan Bjorn so desperately requires, but it also continues for me and for you…all of you I don’t even know…because I will be disabled one day. And you just might be, too. I want it to be better now, for Brendan, and for us whenever we may need it to be. Life isn’t always what we dream it to be, but so long as we do our best to make it all it can be for those we love, then we can dream new dreams. I’ve often thought that the way to get any Government to listen is to put it in terms they understand – MONEY. So, I will discuss here the costs – and the savings – to the Government when it comes to full time family carers such as myself. May they actually listen…and then begin to make much needed reforms to help the carers of Ireland. To receive this allowance, the family carer must be working full time (35+ hours per week) providing care. This is the only social welfare payment requiring full time work in order to receive it. Mind you, that work is in the home, unpaid, and precludes the carer from working outside the home and as such restricts them from contributing to a pension via employment. Carer’s Allowance is means tested. 1 in 10 people in Ireland is a family carer. The State spends €11m less on homecare compared to 2008. Family carers provide 16 million hours of unpaid caring each week in Ireland. Imagine if family carers were to stop providing those 16 million hours of unpaid caring each week in Ireland. What would be the consequence to the Government and our healthcare system? Our healthcare system simply could not handle accommodating the care needs of tens of thousands of people currently being cared for at home by family carers if family carers were to choose not to provide, or were no longer able to provide, in home care. As such, family carers save the State billions each year and keep the healthcare system from totally collapsing. The average daily nursing home care costs €167 vs. average daily in home care costs of €45. Public nursing home care cost average €1,407 per week. Compare that to the weekly cost of a home care package which would range on average from €350 – €500, depending on the level of care required. Inpatient, public, acute hospital care costs average €6,365 per week. As I stated above, family carers provide 16 million hours of unpaid caring each week in Ireland. If those services were purchased, rather than provided by unpaid carers, it would cost the State €10 billion per year – a figure that is 10 times what the Department of Social Protection pays to carers. In other words, a family carer who receives the full Carer’s Allowance at €10,868 annually, provides €66,500 worth of services annually. Many of us who have a family member with disability are stuck in unsuitable – and often dangerous – living situations. Our loved ones are often left without many basic care needs such as access to proper hygienic bathing equipment, safe methods of transferring, proper sleeping arrangements or systems, and much more. I know parents who sleep in the kitchen or dining area just to be near their child with disability. I know parents who receive no in home help or respite at all. I know parents who are trapped in homes that are a danger to not only them, but also to their disabled child. Modification grants only apply if you are fortunate enough to own your own home, but as you remind yourself of the above financial figures, you can see why homeownership is but a dream for many carers like myself. HAP is an utter failure for families with a disabled family member who require a specially modified home – the homes simply are not the type found in the private rental market which is in crisis, over-priced, overly-competitive and lacks any security of tenure. Social housing finds families like mine waiting years, clawing up the waitlist against other families who are also in desperate need of specially modified housing (and what a cruel position to be forced into against each other, might I add). County Councils are acquiring homes for social housing, but at what rate? And, when it comes to those of us who need those specially modified homes…most likely bungalows, an even harder find…how often are those type of homes being bought? I look back to just 9 months ago when the Dublin CoCo purchased 19 luxury apartments in Marianella to be used in their social housing supply. The prices of each apartment ranged from €270,000 to a staggering €480,000. EACH. While I understand that housing prices in that area of the country are more than in the area I live in, I still have to question the rationale for such an expenditure. And in turn, I have to wonder why I was told that the already modified, disability suitable bungalow for sale only 5 minutes away from where I currently live, is “over the allowed acquisition price” when it is barely over the €270,000 figure paid for a 2 bedroom apartment in Dublin. WHY? I must ask why, especially considering that families like mine require these modified homes for the safe care of our disabled loved ones. with severe disability and profound care needs. 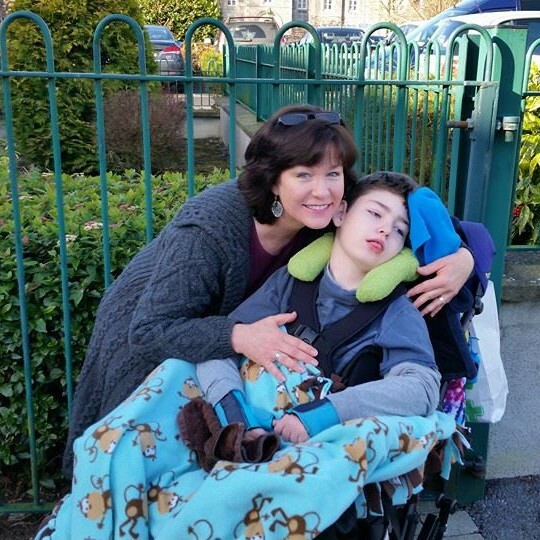 For the price of one 2-bedroom luxury apartment in south Dublin, the same funding amount could purchase a modified, forever home for a family like mine so that they can safely and humanely care for their loved one with disabilities. * Credit for all statistics regarding carers, Carer’s Allowance, and related figures, goes to Family Carers Ireland via their report entitled Economic Value of Care – Why Carers Count. Many thanks for allowing me to utilise their report for the writing of this article.